The Muir Village Market supports many community events, activities and clubs! Skinned, cut, ground, wrapped and frozen to your specifications! Venison jerky, pepper sticks, and salami too! Muir Village Market prides itself on providing great products and service with a small town friendly atmosphere and the convenience of a local store. We are American family owned and operated and welcome our customers as members of our extended family. 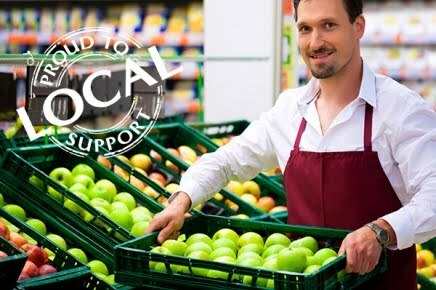 We offer carryout to take your groceries right to your car, that is a unique service to grocery stores anymore! Our Meat Department offers fresh cut quality meats at great prices. Visit the Weekly Sales Ad to check out great specials or stop by the Butcher Shop and check out the selection. Our store features Spartan fresh select produce, a great selection of grocery items, and beer, wine, liquor, and lotto. We have an Ice Cream Shoppe open from April-September with many different sweets and treats for your family. We support our local school and community events and encourage you to do the same! Spartan is a trusted brand with a time-honored tradition of quality and satisfaction. You get the best for less with Spartan brand products. Spartan quality is national brand equivalent or better and the brand is less expensive than most other brands every day. Learn more about the Spartan Brand!